The previously published article, Francisco Gómez Camacho, “Introduction,” Journal of Markets & Morality 8, no. 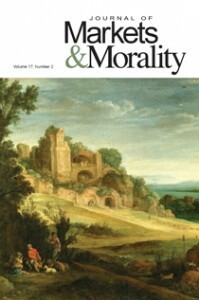 1 (Spring 2005): 167-198, has been formally retracted by the editors of the Journal of Markets & Morality for improper use of published material without attribution. For more information on this retraction, see Jordan J. Ballor, “Editorial: Plagiarism in a Digital Age,” Journal of Markets & Morality 17, no. 2 (Fall 2014): 349-352. Brill’s notice is cut off mid-paragraph and doesn’t provide any details but hints at significant attribution errors. The chapter in question, “Later Scholastics: Spanish Economic Thought in the XVIth and XVIIth Centuries,” is a discussion of academic figures like Francisco de Vitoria and Domingo de Soto. Here’s the complete notice as it appears on Brill’s website. As for the introduction in The Journal of Markets and Morality, an editorial in the journal, titled Plagiarism in the Digital Age and authored by executive editor Jordan J. Ballor, offers some additional explanation. It has been our practice to take many of these translations and publish them separately, often in corrected, expanded, or otherwise more developed form. It was only through the process of bringing Molina’s treatise to print in the ongoing Sources in Early Modern Economics, Ethics, and Law series that the problems with Camacho’s introduction became apparent. In tracking down some irregularities with the citation method of Camacho’s apparatus, a number of direct, substantial, and nearly verbatim sections were found that corresponded with places in Marjorie Grice-Hutchinson’s magisterial work, The School of Salamanca, first published in 1952. In particular, the section of Camacho’s introduction titled “Economic Context” draws heavily and substantially on Grice-Hutchinson’s work, without attribution. The final paragraph of the section “Financial Innovation and Excesses” also relies on Grice-Hutchinson, again without attribution or other normal means of signaling to the reader that the words on the page are not original to the author of record. In fact, Grice-Hutchinson’s volume is not mentioned by Camacho, although another of her publications is cited in passing at the conclusion of the introduction. Meanwhile, the integrity of the Molina translation itself persists, and we have commissioned another introduction for the separate publication, forthcoming from CLP Academic in the Sources in Early Modern Economics, Ethics, and Law series. Our hope is that this unhappy incident will not stand in the way of increased exposure to the economic thought of one of the foremost Jesuit theologians of the early modern period, and more broadly a better understanding of the development in economic and moral thought during this period. What has changed even more recently is that the digital dissemination of intellectual material has made plagiarism both easier to commit and easier to detect. With a simple cut and paste maneuver huge blocks of text can be moved from a web page to a word processer. However the same works in reverse, and massive search engines like Google, as well as specialized services like Turnitin, have made plagiarism detection a cottage industry (and for some professors, an unavoidable component of their occupation). There is, in fact, no system that is incorruptible. What is made by man can be abused by man. We’ve been unable to find verified contact information for Camacho, but have contacted someone named Francisco Gómez Camacho on LinkedIn, affiliated with the Universidad Pontificia Comillas, who we believe to be the author in question here. We have also reached out to Brill Publishers for a statement. We’ll update the post if they respond. Philosopher Michael Dougherty alerted us to a third instance of plagiarism from Camacho, a book chapter. On the blog Thomistica, Dougherty noted that the introduction pulled by The Journal of Markets and Morality was published in “nearly identical” form in Sourcebook in Late-Scholastic Monetary Theory, edited by Stephen J. Grabill. Yes, we did stop selling this book due to plagiarism in Camacho’s chapter. With reporting by Ross Keith. That posting also offers a longer extract from the Brill retraction.